INDIA: India's Navy on Friday retrieved three badly burned bodies from a submarine that exploded in a Mumbai dockyard and said it was unlikely any of the other 15 missing crewmen would be found alive. The diesel-powered INS Sindhurakshak sank in a military dockyard early Wednesday, dealing a setback to India's naval ambitions just days after it unveiled its first domestically made aircraft carrier. 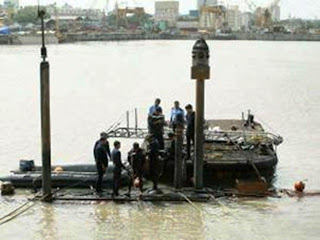 Navy divers managed to enter the vessel, whose forward section was totally destroyed in the fire, but their progress was hampered by extreme heat, poor visibility and mangled hatches. The first bodies were retrieved from a compartment behind the tower Friday and have been sent for DNA testing because severe burns prevented their identification, a navy statement said. The state of the bodies and conditions within the submarine “leads to the firm conclusion that finding any surviving personnel within the submarine is unlikely”, the statement said. It also suggested some bodies might never be found because of the fierce temperatures generated in the fire during which some of the weapons on board -- cruise missiles and torpedoes -- ignited. The families of the 18 men on board at the time of the explosion, whose names have been released, have gathered in Mumbai. The 16-year-old submarine, whose name means “Protector of the Seas” in Hindi, returned from Russia in April where it underwent a two-year overhaul of its communication, weapons and propulsion systems.